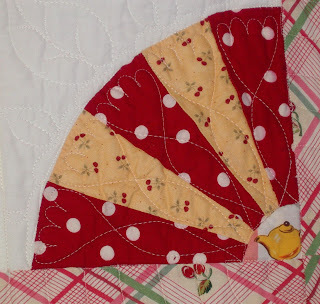 This week I saw the cutest fan quilt on Glenna's blog. Glenna is a fabric and quilt designer and also sells feedsacks. I've been buying her fabric and patterns for years. I'm sure many of you have been, too. Glenna is a great lady with loads of talent. She's going to open an Etsy store to sell her items soon. I am always asked where I get my feedsack squares from and my first choice is Glenna. 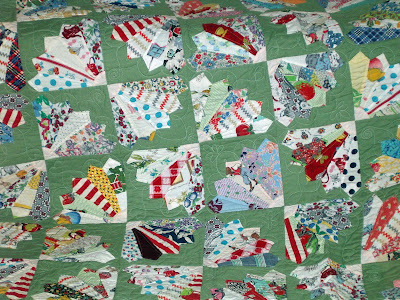 Anyway, go to her blog and scroll down until you see the fan quilt she recently bound for a friend. Its so darling. 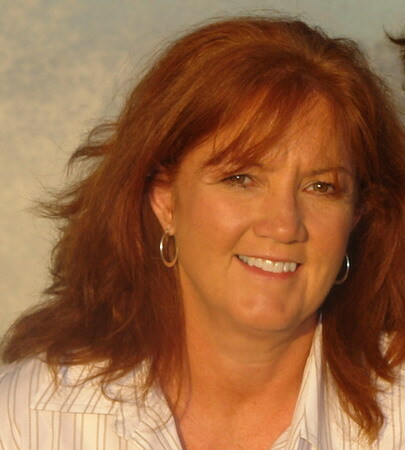 While you are at Glenna's blog enter her giveaway and give an opinion on her new blog layout. 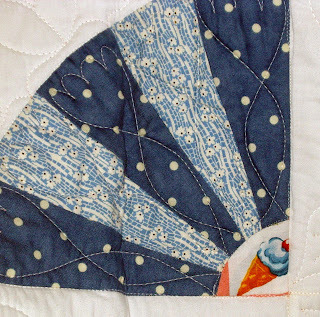 The quilt on Glenna's blog is quite a bit like the fan quilt I made in 2004. All my fans are from feedsack pieces so its scrappier than Glenna's friend's quilt. I chose this green color because of an old quilt from my childhood that had fans and this color green in the background. 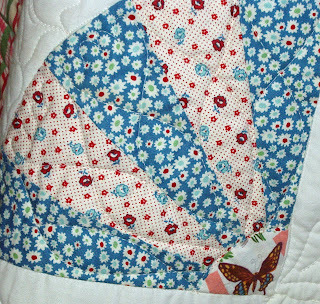 I had been saving up scraps of feedsacks for a while when I made this quilt and then I hand appliqued the fans onto squares in the car during a cross country trip from Utah to Pennsylvania in 2004. So this quilt brings back good memories from my childhood and also from our family trip across the country. I love the colors and shapes. This is a favorite quilt of mine because and it makes me so happy to look at it. After I making that quilt I decided to make a child size quilt fan quilt. I have so many baby quilts but I wanted to make something bigger like for a youth size bed. 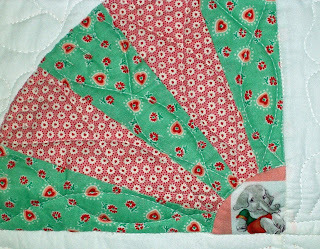 I made each fan in 2 fabrics much like the fan quilt on Glenna's blog. 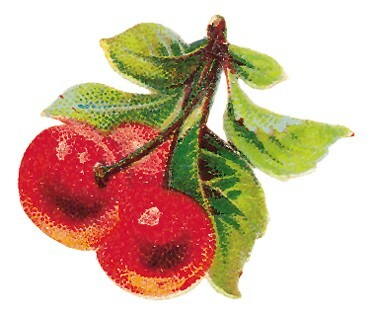 And I bordered it in cherries (what else?). I fussy cut the ends of the fan with little toys and items from a reproduction novelty fabric. Each corner has something different in it. I have this quilt folded on a shelf in my family room. I'm not a grandmother yet. But you never know. 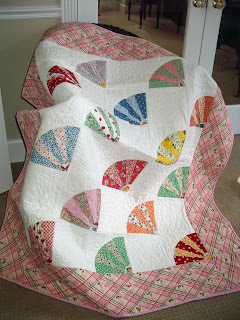 Both quilts are adorable - love the "toy" in each corner of the fan. I've never made a fan quilt - hmmmm - something to ponder! 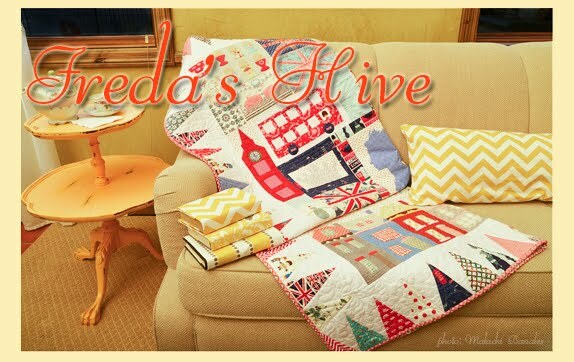 So much talent in Freda's Hive! so fun! i love the fans. you are just so full of cuteness! Great fan quilts. I have not had enough courage to try this type of pattern myself yet. Beautiful quilts. I love fans. I especially love the last fan with the little teapot in the "corner". I love tea and pots. I love finding great new blogs. Thanks for the tip on Glenna's blog. I just love your blog! You inspire me! 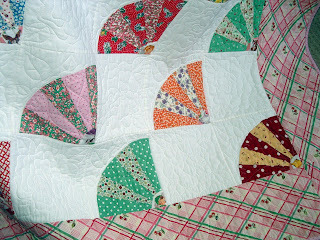 I love the feedsack fan quilt - especially the way you bordered it and finished it with the scallop edge. Wonderful!! your fan quilts are beautiful! Love the quilts. 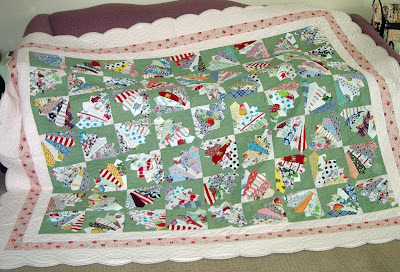 One of my first quilts was a fan quilt. I put it out in my patio. Unfortunately, it faded. I am glad you reminded me to take pictures at the quilt show because I normally forget to bring my camera! Awesome quilts. You are so inspiring. That baby quilt is adorable -- you're SO clever Nanette! 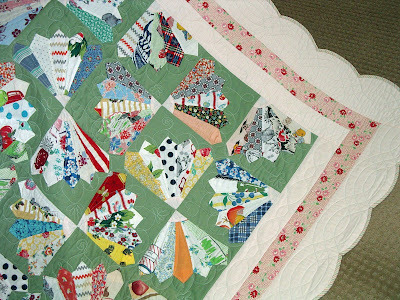 I love the green one too -- it reminds me so much of the 30's quilts. You definitely need to be prepared for the grandchildren, 'cause when your kids start reproducing, you're going to have a LOT of them!!! Fabulous quilts. I really love the fussy-cut toys in the corners of the fans! How wonderful those quilts are! Thanks so much for sharing their stories. As usual, I LOVE YOUR WORK! Wow ... you are a fan of fans. I just love the colors ... and the little fussy-cut corners, of course. I can't decide which one is my favorite. But I can certainly see how that green one holds fond memories. :) Very very precious. Youth size is a good one.. not too big, but big enough. 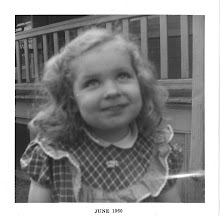 hank you so much for showing us these, and for the links to Glenna's site. I'm on my way there to check it out. Both quilts are absolutely beautiful, Nanette. You do such amazing work! Those fans are so beautiful. 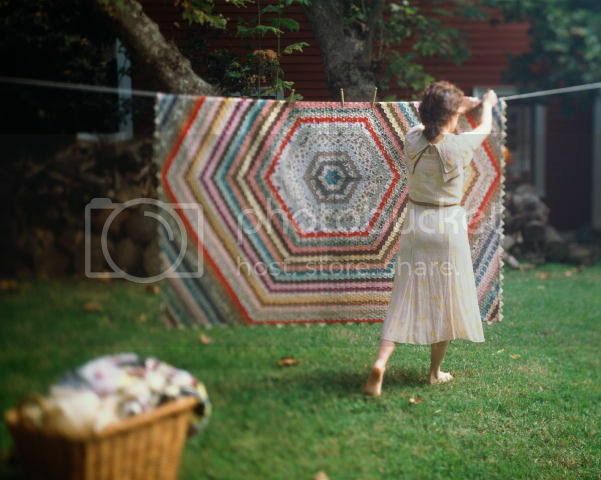 Your fan quilts are just splendid. I've only ever made one and am itching to do another! So very pretty, Nanette!! I love looking at your fans too! Thanks for letting us enjoy them!! A feast for the eyes! Nanette, I am in love with both your quilts and Glenna's. Absolutely lovely. Now I have another project for my 30's to add to my list! I love it! Of course, I love all 30s and 40s reproduction quilts! I love your fan quilts! Nanette, you constantly amaze me. Love the fan quilt and the green background! So vintagy. I'm always so inspired by you and your blog. Loved all your birthday posts btw. ! Awesome possum! Fan quilts are definitely one of my favorite patterns. Love the corners - what a great touch. You are always so inspirational! Both are wonderful. Love the scallops on the edge. Always wanted to try that!